When I was told I have endometriosis, I naturally went online to find out a bit more about it. This led me the website for Endometriosis UK, a charity that supports women with the condition. As well as the explanations and hints and tips, I read quite a few of the personal stories on the website. They were pretty shocking – any pain I’ve had seems like a walk in the park compared to what some of these women have been though and their experiences were often made ten times worse by late diagnoses. A lot of the women on there spoke about how changes to their diet seemed to help alleviate the symptoms, which I found interesting. Towards the end of last year my diet was pretty awful. It’s never been great but being extra busy and on the move a lot of time seemed to make it worse – lots of train station croissants for breakfast, carb-y buffet fair whilst at events and cheeky cakes with my americano’s at coffee shop meetings. My waistline as well as my general health were telling me that things needed to change! So, I started thinking not simply about eating healthier but eating in a way that might help with endometriosis. Some women telling their stories on the Endometriosis UK website said that consulting a nutritionist had helped, so I thought that’s where I’d start. I googled ‘nutritionist Cardiff’ and came up with Joanne Crovini at cardiffnutritionist.co.uk, who seemed to fit the bill. After submitting a food diary and a pretty hefty amount of medical information I met with Joanne in a room above Canton Health Foods store the other week. She was very nice and her conclusions seemed to make sense – the way I was eating, I was sugar-rushing and crashing like a yo-yo throughout each day and needed to eat foods that released energy slowly to keep me nice and balanced. This means I’m to avoid sugar, refined carbs (white bread/rice/pasta), potatoes, fried food, red meat and dairy and up my intake of essential fats (oily fish, nuts, seeds, etc. ), protein, vegetables (especially broccoli) and dark berries. Obviously, the advice Joanne gave me was a lot more detailed than that but I won’t bore you with the finer points here. 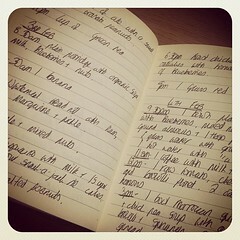 What I shall do is continue to keep a food diary until I see Joanne again in March. Although I’ve embraced the Pink Pad technology with keeping track of my cycle, I’ve been pretty old school with keeping a food diary so far and written it out longhand at the end of each day in a little notebook. But then I spotted Nat Higginbottom’s online food and ‘4 Hour Body’ diet diary chinup.posterous.com and I thought, what a brilliantly simple and visual way of doing it! I can do it all with my iphone, include photos of my meals to see as well as read about what I’ve eaten and include any odd related notes/reflections on the day. So I’ve pretty much copied Nat’s technique and created getgoodeats.posterous.com (hope you don’t mind, Nat! ), more as a record for myself than anything but available for my nutritionist or anyone else who might be vaguely interested to read. I’ve been on the diet for a couple of weeks now and so far, so good. I get the odd craving for bread and cakes but it’s not overwhelming and the variety of foods I’m trying to eat combined with experimenting with new recipes and Carl’s slow cooker has meant no boredom has set in. That said, I’ll not be shying away from the inevitable lapses I do have and looking at why these might have occurred and getting back on the right track again afterward. I think I’m already starting to feel the effects – less up and down, less ‘afternoon dips’ of severe sleepiness around 3pm and a bit more energy. However I am finding certain things difficult, such as cutting right back on caffeine. So I suppose time will tell on how I get on with all.